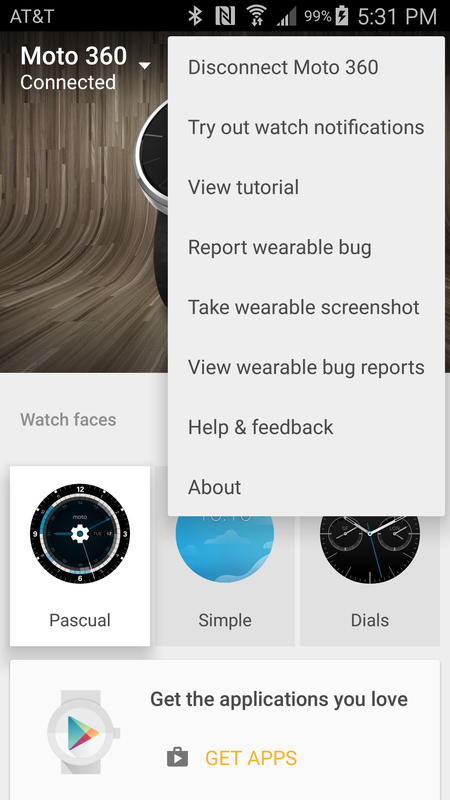 Google let the cat out of the bag yesterday with a blog post detailing just what we should expect in the next major version to Android Wear. 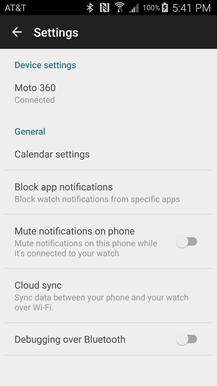 An upcoming software update will be adding Wi-Fi support, always-on apps, and a few other interesting options. 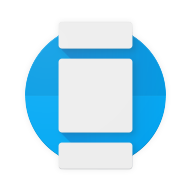 While we wait for new firmwares to hit our wrist-bound hardware, the Android Wear app just received its own update to prepare for the new features. This isn't just a small maintenance release to add configuration screens, there are some major visual and organizational improvements, and a few new features. 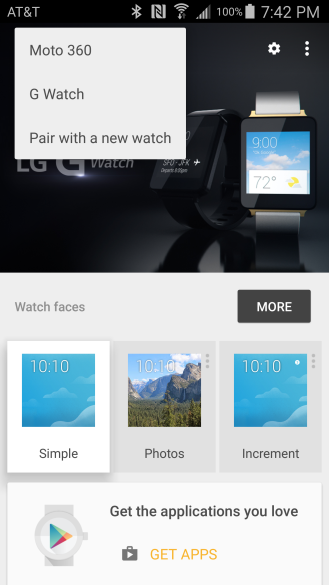 Most of the main screen has been completely redesigned. 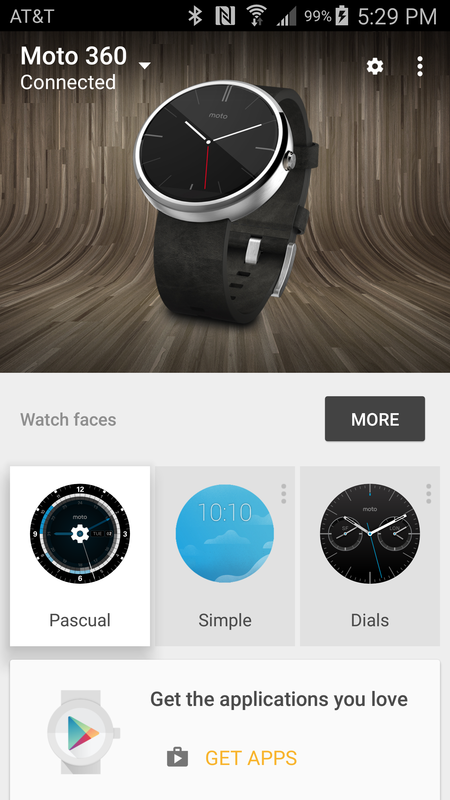 A photo of the currently paired watch and the watch face selector are still prominently displayed at the top of the screen, but all of the sections below the photo are now outlined in Google's Card style. The extra contrast from the raised cards looks much cleaner than the old interface. 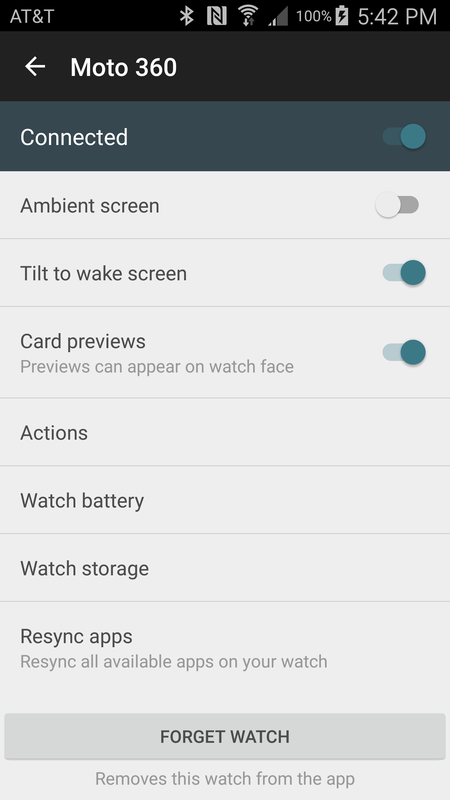 In addition to the watch face selector and voice actions, there is also a prominent shortcut to the Play Store for more apps, a Tips card for newcomers, and a pair of sample notifications to try out. 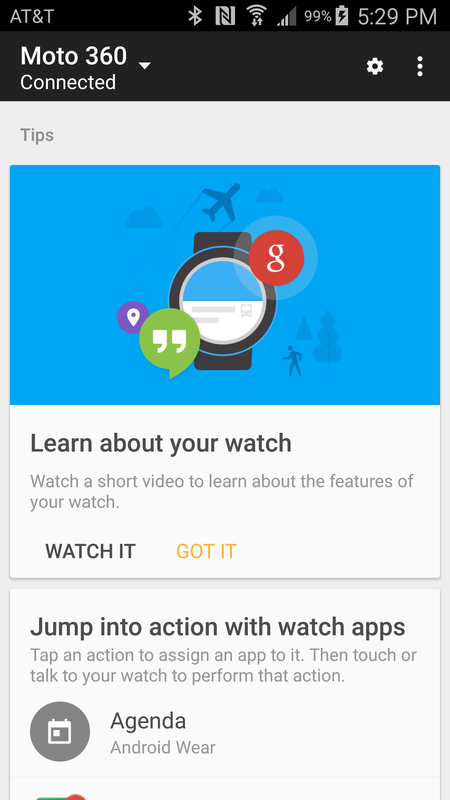 Don't worry, except for the Play Store shortcut, both of the new bits can be dismissed or disappear on their own. 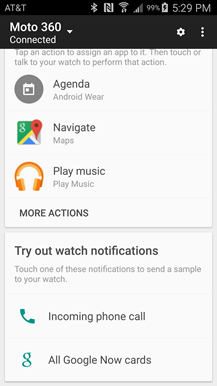 The section for voice actions no longer displays a full list, but there is a shortcut to the remaining options. 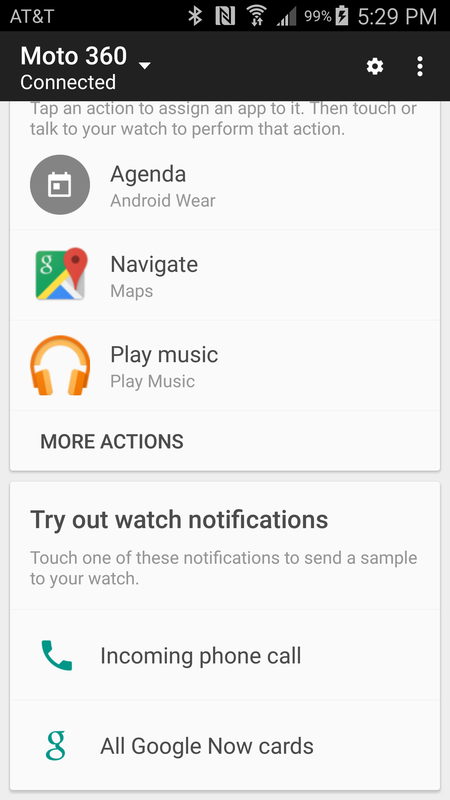 Wi-Fi is the headlining feature for this update, and it's immediately apparent after launching this version. 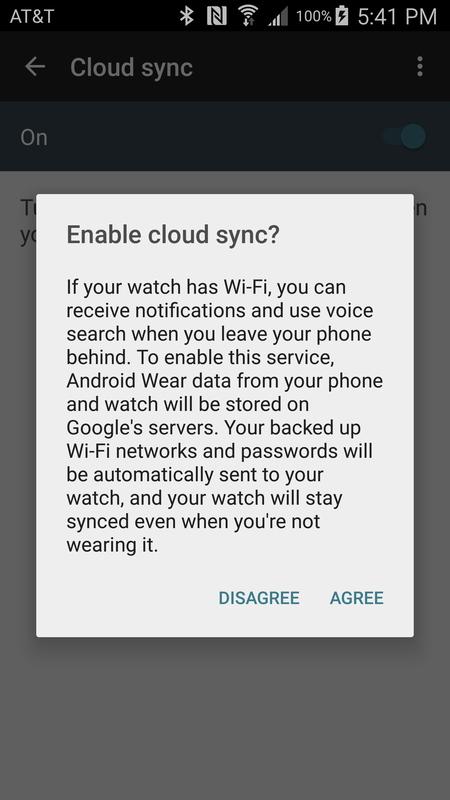 After updating, users are prompted to grant permission for cloud sync to use Wi-Fi and to allow Google Fit to use sensor data. Even if permission is granted, cloud sync still has to be manually enabled in the Settings screen, at which point a dialog further explains the advantages. 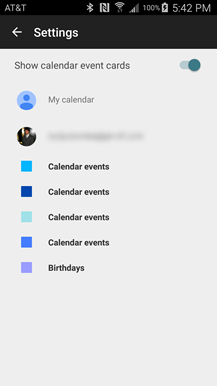 Another important change shows up in the new dropdown menu located at the top-left. Users can now pair multiple Wear devices and quickly switch between them without dealing with a new re-pairing process. 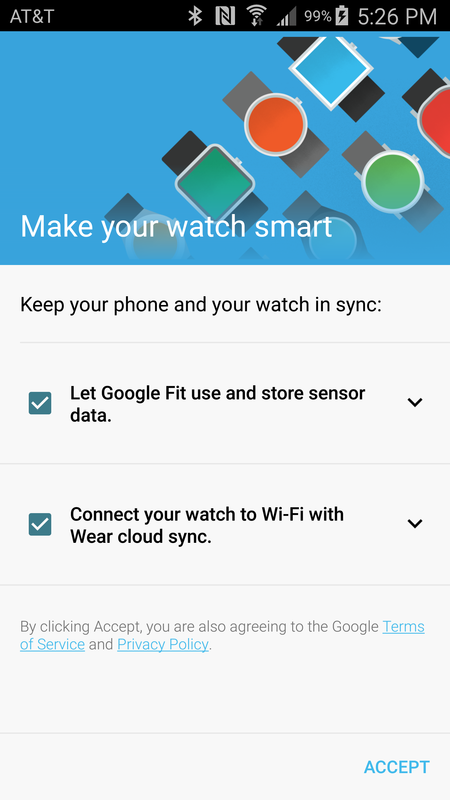 There may not be a lot of people with more than one Wear device, but it will come in handy for anybody that wants to keep both a stylish and a rugged watch, or separate fitness trackers. The overflow menu has also lost a couple of options: Forget and Demo cards have been removed from the overflow menu. 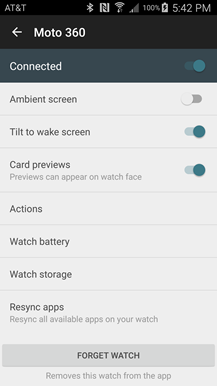 Finally, the Settings screen was redesigned to separate device-specific and general settings. 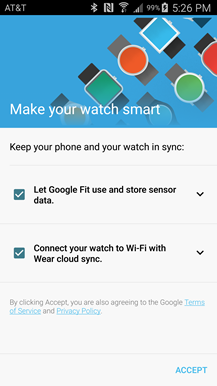 The device settings screen brings together all of the configuration options that control how your paired Wear device actually operates. One new key feature is that calendar events are no longer limited to a user's primary email account, but now allow for events from all of the signed-in accounts. 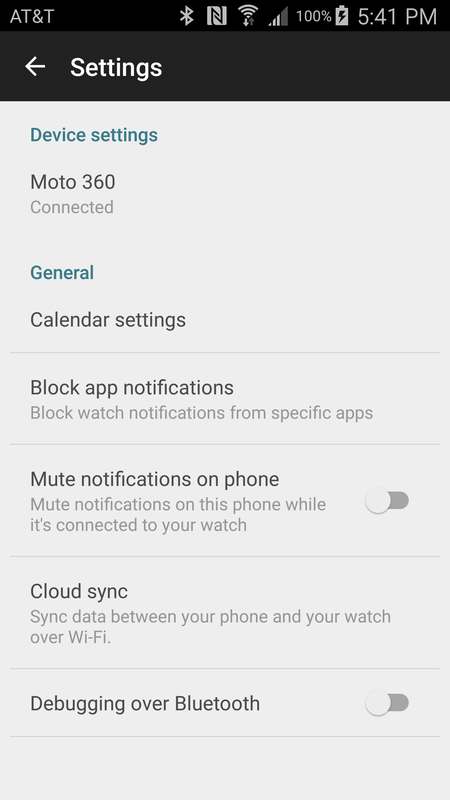 Additionally, there is a Calendar settings screen for picking which calendars are allowed to show up on Wear. We can probably look forward to seeing these icons over the next couple of weeks as the update hits our watches. These are called Cue Card, Wi-Fi, and Wrist Gestures. 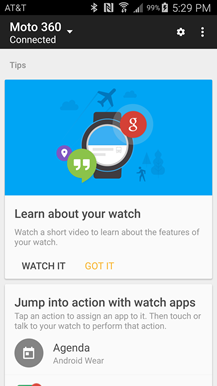 This update also installs Google Play services 7.3.27 to any paired watch. We're still looking around for more changes. If you find anything, mention it in the comments.